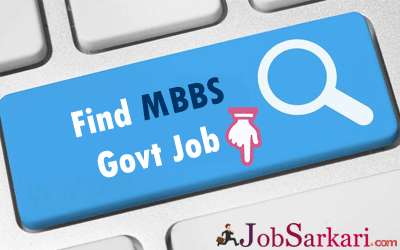 What are the various government job opportunities for MBBS students? Among the people of the latest generation, some of them are interested in private sector jobs. But there are also some candidates who eager choose to take up jobs in the government sector. Even in times of great economic depression in your country, the company would pay you good salary package. Companies also give you the security to draw your pensions till death. The pension schemes under various both for central and state governments. With fixed office timing, employees get some time to spend on their own. In addition to salary, the government sector employees are also guaranteed free health care facilities and housing facilities with other additional allowances. With high job security, employees do not have to fear about being fired at any point in time. Even at the entry level, any government sector employee is paid more than the corporate sector. Likewise, government doctors having MMBS degree are paid around 80,000 per month whereas it is much less for the private sector jobs. The Bachelor of Medicine and Bachelor of Surgery or MBBS degree takes a long duration of five and a half year. Similarly, after completing your MBBS, you also have the opportunity to work in the government sector. You can apply for the government hospitals. Some of the government sector jobs also prefer doctors in medicine, pediatrics, surgery and all departments as well. According to the present scenario, a huge number of vacancies is created for candidates with medical qualifications. Click Here for M.Pharma Govt Jobs. Under NTPC limited, aspirants who have MMBS degree can apply for the post of medical officers. The responsibility of the medical officers includes taking care of the person and his or her family and giving the necessary medical assistance to the individual. They are responsible for undertaking all the activities under the health and family welfare scheme. They also distribute the work in case of emergencies. They also provide service to minor ailments via health assistants or health works. The government-run hospitals also appoint health inspectors who are responsible for a whole lot of tasks. It starts with water resource in the health centers and chlorination of the same. Also, the sanitation measures should be examined by the health inspector. After completing the MBBS degree, they can easily opt for this pot under the government hospitals. The health inspector should be well aware of the overall functioning of the hospital. Apart from the sectors mentioned above, they can also apply for the post of assistant professor for government-run medical colleges. They can also start medical firms that are often sponsored by the government sector. Other than this, the aspirants can also become a visiting or resident doctor in departments such as railways, lecturer or demonstrator in government medical colleges. It is usually seen that the MBBS candidates work under a team of skilled senior doctors, but with the increase in their experience, they get more skilled. Several job opportunities are released by the government sector for MBBS students. For recruitment, several programs and drivers are created by the companies.